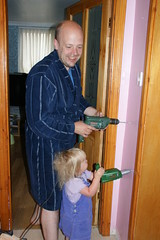 I've got a new powertool so I can do DIY with my Daddy now. That'll be good fun. Mummy says she wishes she could DIY my hair in the morning - for some reason she finds it quite unmanageable!